Will museums stop accepting Sackler money in wake of Massachusetts lawsuit? Theresa Sackler, one of the most generous arts philanthropists in the UK, is being sued by the state of Massachusetts, along with seven other family members and Purdue Pharma, the company they own and direct. The Sacklers and their pharmaceutical firm, which produces and sells the highly addictive opioid OxyContin, stand accused of helping fuel the opioid epidemic which is devastating the US and has killed 11,000 people in Massachusetts in the past decade alone, according to the complaint filed by the state’s attorney general, Maura Healey, on 12 June. “Purdue Pharma created the [opioid] epidemic and profited from it through a web of illegal deceit. First, Purdue deceived doctors and patients to get more and more people on its dangerous drugs. Second, Purdue misled them to take higher and more dangerous doses. Third, Purdue deceived them to stay on its drugs for longer and more harmful periods of time. All the while, Purdue peddled falsehoods to keep patients away from safer alternatives. Even when Purdue knew people were addicted and dying, Purdue treated patients and their doctors as ‘targets’ to sell more drugs. At the top of Purdue, a small group of executives led the deception and pocketed millions of dollars,” the complaint states. 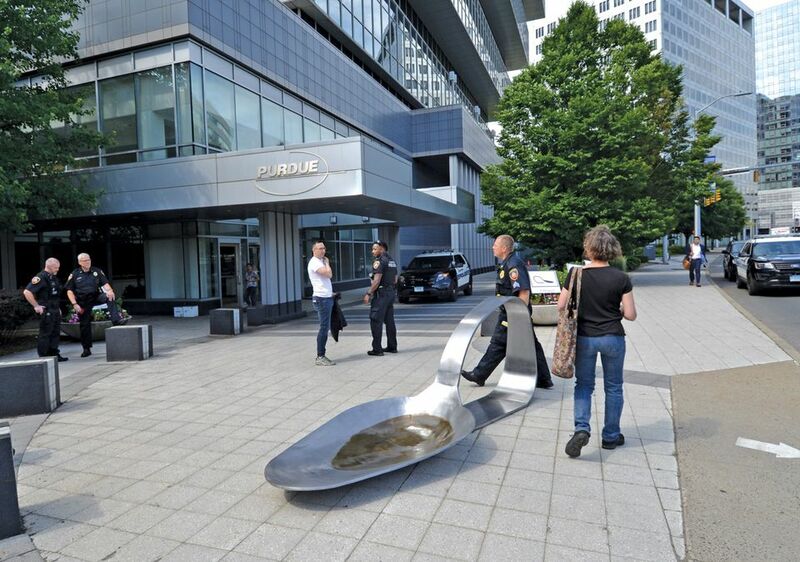 While several US states have sued Purdue Pharma, Massachusetts is the first to target individual Sackler family members. The state alleges that “board members [such as Theresa Sackler] are intimately involved in the activities of Purdue Pharma often on a weekly or even daily basis”, and cites numerous internal company reports which suggest that they were fully apprised of the firm’s deceptive operations and profited handsomely from them. “The directors…knew about, allowed and directed Purdue’s deception,” the complaint states. The attorney general “demands a trial by jury”, the complaint says, and is asking the court “to end Purdue’s illegal conduct and make [the firm] and its executives pay for the harm they inflicted in our state”. Theresa Sackler is the widow of Mortimer Sackler who, together with his late brother Raymond, presided over Purdue Pharma’s launch of OxyContin in 1995. A third brother, Arthur, died in 1987 and his widow, Jillian, and descendants did not profit from OxyContin, they say. Arthur’s descendants are not named in the Massachusetts suit. It was Arthur Sackler and his heirs who funded many of the US museums which carry the family name. In the UK, however, Theresa Sackler has been a prominent supporter of institutions through her Sackler Trust and Dr Mortimer and Theresa Sackler Foundation. Her donations reportedly include around £2.5m to the Victoria and Albert Museum (V&A), where she serves as a trustee, around £5.5m to the Serpentine Gallery and more than £4.6m to the Tate. All three say they follow internal ethics or gift acceptance policies or, in the case of the Serpentine, abide by the Fundraising Regulator’s code of practice when considering donations. However these gifts were made before the publication last year of articles in the New Yorker and Esquire magazines that revealed that the source of the Sacklers’ fortune came from the sale of opioids and alleged their firm, Purdue Pharma, had consistently deceived doctors and patients to make more money. The National Portrait Gallery is the first British museum that must decide whether to accept a major gift from Theresa Sackler in the wake of these revelations. Its trustees are due to review a £1m pledge from the Sackler Trust that “is currently going through our internal review process in line with our ethical fundraising policy and charitable objectives”, a spokeswoman says. Just as it took landmark legal judgments for museums to conclude that it was no longer expedient to accept money from the tobacco industry, it will most likely require similar court rulings before institutions decline the implicated Sacklers’ opioid money. Museums rarely lead on issues of morality, notes Adrian Ellis, the director of the cultural advisory firm AEA Consulting, who characterises the industry’s actions on the restitution of Nazi-looted art as “generally reluctant moves under duress”. He believes that institutions may begin to question their acceptance of Sackler funding if Massachusetts wins its case, or if the case goes to trial and gets extensive publicity, or if other state attorney generals follow Massachusetts’s lead and decide to target individual Sackler family members. Purdue Pharma and the Sacklers and other company executives named in the Massachusetts suit are expected to file motions to dismiss the case in the next few weeks.